You would like to achieve greater productivity with your mould: less waste, wear, weight and noise as well as a longer life cycles and flexible settings on your machines. We can develop solutions for your specific needs based on your technical challenges. The pioneering spirit at RAMPF leads to a steady stream of new innovations in mould technology. We invented the CSI, CSI Diamond and CSI Nitro heat treating technologies. 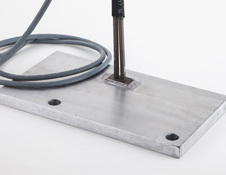 Optional extras, such as heated tamper shoes, centring of the tamper heads, density control, FlexWay® – or our brandnew NanoTech-Line – are milestones in mould manufacturing – and just a few examples of the tremendous technological innovation at RAMPF. The heater plate developed by RAMPF can be used in paving stone and slab moulds in particular to reduce the adhesion of the face mix to the tamper shoe surfaces. 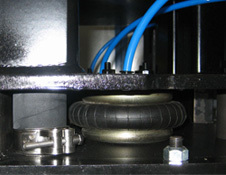 The major benefit: The tamper shoes do not overheat when production is interrupted. In general, the use of the heater leads to denser and more impermeable block surfaces, thereby increasing the quality of the concrete products that are produced. The cycle time is also reduced due to the easy demoulding process. Pneumatic RAMPF density control ensures that the necessary block density and height is achieved and therefore a consistent quality of concrete product is obtained due to the uniform compaction. The use of this optional feature developed by RAMPF generates less waste especially with tall face blocks or large slabs and the block surface is also particularly smoothed with the finest face graining. Plungers have the advantage that they can be bolted on and replaced easily. This provides easier access and facilitates modification work on the mould equipment. 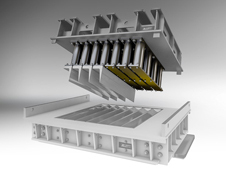 The modular slip system ensures precise insertion in the mould. 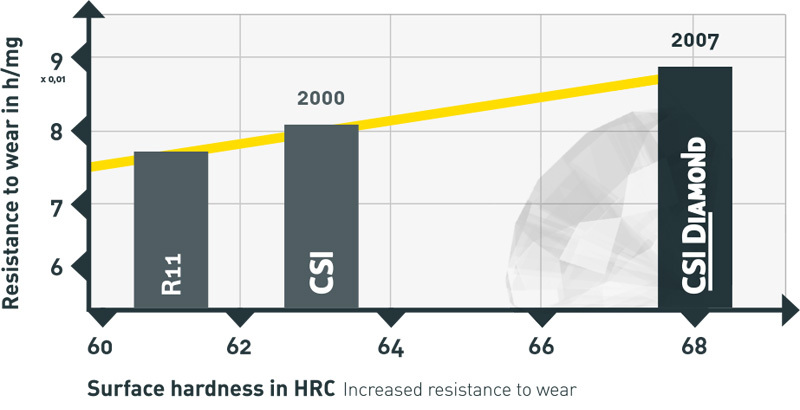 Benefit from an improved cycle output and increased productivity through less abrasion and waste! Produce concrete blocks precisely to the specified height across the entire range even quicker, more economically and more consistently with height control. It can be used without modifying the machine and therefore after just a few manual adjustments. Multi-level tamper heads are ideal for different block heights and deep dummy grooves or imprints in the concrete product as they are easy to clean. With the Rampf oscillator, mould frames and mould inserts have a durable elastic connection instead of being rigid. This means that the mould insert vibrates effectively in the mould. The result: The block density across the entire range is consistently improved. The conventional construction (frame and insert) is replaced by an ingenious combination of a system insert and side elements with this design. An intricate lattice structure with specific spaces positioned in the system insert optimises the vibration behaviour and ensures uniform vibration behaviour in the mould and concrete batch. The folding wall enables the production of kerbstones with face mix on the surface as well as the side faces. Unusual block designs with undercutting at the bottom or back can be created easily and safely with this innovative technology due to the moving profile parts. Bolted cover plates can be replaced more easily, thus reducing any downtime. Bolted frames and inserts are a great advantage to carry out modification and repair work as quickly as possible. We have developed the ideal hardness grades for moulds in accordance with your machines and products. Your entire production of concrete products will benefit in terms of extreme durability from our finished mould surfaces. It is best to arrange a personal meeting to find out the right optional extras for your concrete product and/or machines. Please contact our Sales team!